The Best Dinner Rolls - Bake.Eat.Repeat. 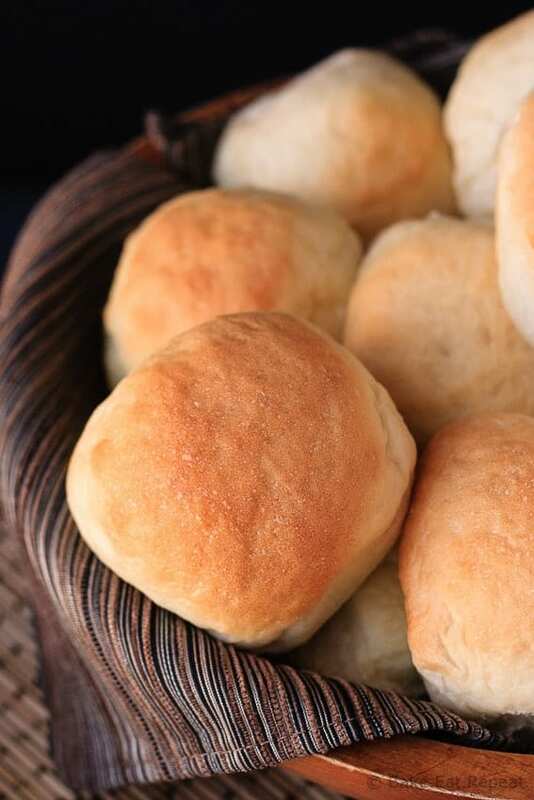 Easy to make dinner rolls that are soft and fluffy and absolutely perfect! You will never need another dinner roll recipe. I love these dinner rolls. They really are the best. Really. I know you may already have your favourite recipe, the one you make every time you need dinner rolls for a meal. Or maybe you never make yeast breads because you think it will be too hard (trust me, it’s not – if I can do it, anyone can!). Or maybe you only ever make whole grain ones. Regardless, you should make these dinner rolls. Because they are the best. And even though I am typically all for the whole wheat, whole grain, seedy, good for you breads – I love these. 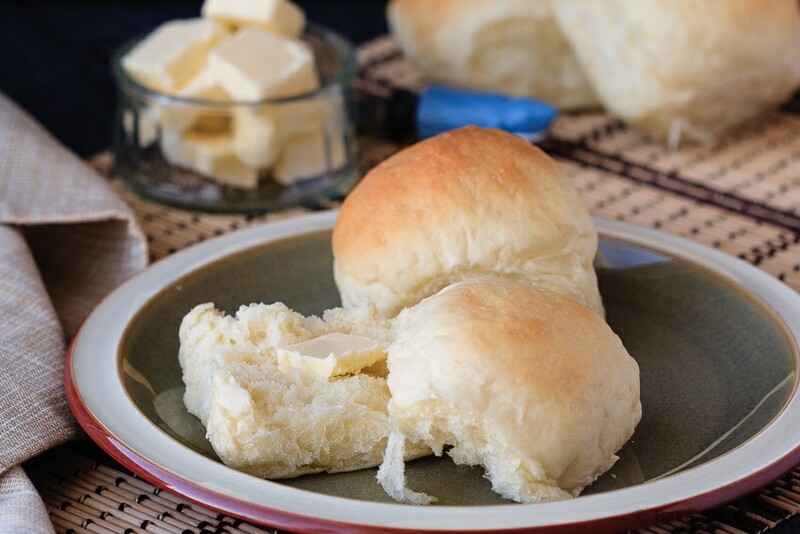 Soft, white, fluffy, perfect dinner rolls. Sometimes you just want a soft white dinner roll and the healthier, whole wheat version won’t cut it. And when that’s what you want, this is the recipe you should make. I have made these dinner rolls more times that I can count, and they always turn out perfectly. Plus they’re super easy to make and are out of the oven in 2.5 hours which is pretty quick as far as yeast breads go. And they freeze beautifully which is a necessity with bread as far as I’m concerned. 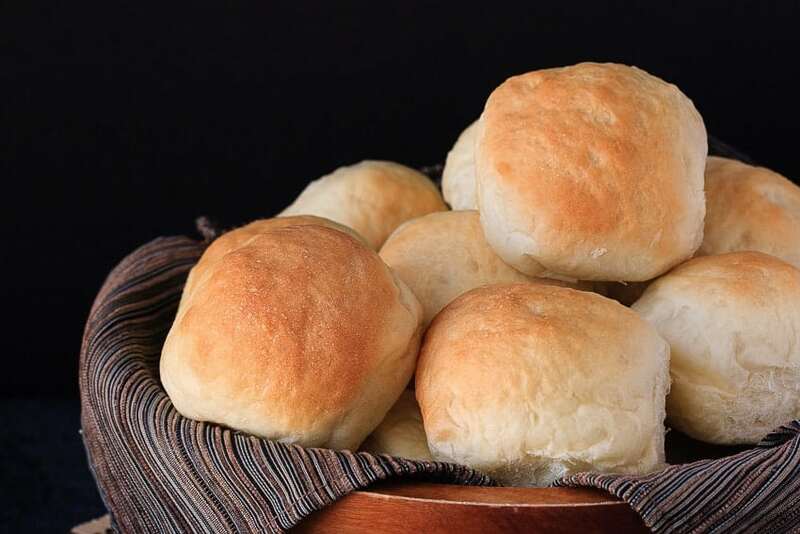 If I’m making dinner rolls, I want to be able to triple the batch so I can freeze a whole bunch of them and have them on hand when I want them. It’s always so much less work to make a larger batch then it is to make them 3 times. Obviously. So if you’re looking for a new dinner roll recipe to try for your Easter dinner this weekend, make this one. Because it’s the best. Really. Combine the water, yeast, sugar, oil, salt and 3 cups of the flour in the bowl of a stand mixer. Using the dough hook, mix until the dough comes together. Slowly add the last cup of flour, stopping when the dough pulls away from the sides of the bowl. It should be smooth and slightly tacky but not sticky. You may not need the full 4 cups of flour, judge the dough by how it feels, not how much flour you’ve added. Knead the dough for 5 minutes (10 if mixing by hand) until it’s very smooth. Transfer the dough to a lightly oiled bowl and cover it tightly with plastic wrap. Let it rise until it has doubled in size, about 1 hour. Punch down the dough and turn it out onto a lightly oiled countertop. Divide the dough into 12 equal pieces and roll each into a round ball. The easiest way is to roll the piece of dough against the countertop underneath your hand until it forms into a smooth ball. Place the shaped rolls on a lightly greased or parchment lined baking sheet. Cover them loosely with lightly greased plastic wrap and let them rise until doubled, about 45 minutes. Preheat the oven to 400 degrees F. Once the rolls have risen, bake for 12-14 minutes, or until they are lightly browned. Remove them from the baking sheet to a wire rack to cool completely before storing in a sealed plastic bag for up to 5 days, or freeze for up to 3 months. Source: Slightly adapted from Mel's Kitchen Cafe . There's two kinds of yeast you can buy, instant and active dry. Active dry has a larger granule and needs to be dissolved in water before using it. Instant yeast has a finer texture and can be mixed right into dry ingredients. You will find them right next to each other in the baking section of your grocery store. I prefer using instant yeast as it eliminates one step in making bread! Can u tell me your receipe in gram please. If I follow the metric conversion it is always a failure. Thank you. No problem Shirley! I've added the weights into the recipe now. Thanks - I'm so glad you enjoyed them! These look like perfection! I rarely make yeast bread because I"m so impatient, but I love that these can be frozen ahead of time! I totally agree! I usually like the seediest, wheatiest bread... but when it comes to something like dinner rolls, the whiter and fluffier the better! These look so yummy. I've never made my own dinner rolls but I think I need to try it!! These rolls look so light and fluffy! Homemade dinner rolls are the best!